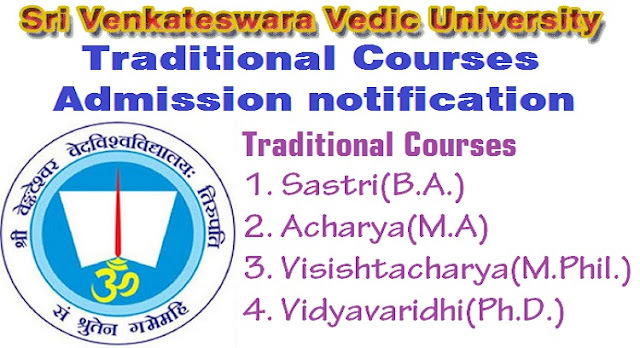 Sri Venkateshwara Vedic University Traditional Courses Admission Notification 2018-2018/Sri Venkateshwara Vedic University traditional courses admissions 2018: Sri Venkateshwara Vedic University has issued Admission Notification 2018-2019 and the vedic university invites applications from the eligible regular candidates for admission into Traditional Courses Sastri (B.A. ), Acharya (M.A), Visishtacharya (M.Phil.) and Vidyavaridhi (Ph.D.). Medium of Instruction: All the subjects in Acharya course deal with the main subjects and the medium of instruction and examination will be Sanskrit only. Part-I (Main Subject) : Oral Test for 60 Marks dealing with the main Subjects concerned in the level of eligibility prescribed for the course. Part-II (Ancillary Subject): Written test in Sanskrit for 30 Marks and written test in English for10 Marks to test the candidates acquaintance with the two languages. 1. The last date for receipt of the filled-in application Sastri and Acharya Courses in the office is ...-6-2018. 2. Last date for Visistacharya (M.Phil) and Vidyavaridhi (Ph.D) Courses is ...-6-2018. 3. Date of Entrance Test : ... (written), ... (Oral test),...(Interview) of June, 2018 at 10.00 A.M.
Venue : S.V.Vedic University, Alipiri-Chandragiri By-pass Road, Tirupati. 517 502.